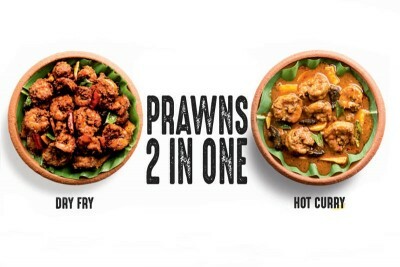 Try these unique Heat & Eat Prawns. One simple marinade - two super dishes. You can fry it in oil to crispy perfection, or cook it gently with water and then optionally with a bit of coconut milk into a yummy, silky gravy. Either way, it will be music to your tastebuds. Great with Rice or rotis. Deep fry recommended for best taste - Fry the marinated prawns in oil, preferably coconut oil and serve hot, as simple as that. Place the marinated prawns in a pan. Add half glass of water and gently cook under low flame. Once its near ready, optionally add 4 spoons of coconut milk and let it simmer until the water reduces and gravy thickens. Stir well while simmering. For best taste, Garnish with a spoon of fresh coconut oil and fresh curry leaves before serving.